Almost every successful business started with an effective marketing plan and yours can too. Learn how to create a highly effective marketing plan to increase market share and guide your business into success! You can now discover from the pros how to develop your own marketing plan complete with strategies and techniques that will really work through our amazing ebook. Most businesses will not succeed. Approximately 91% of businesses fail within 10 years, over 50% within five years, and almost 25% within the first year. 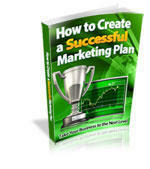 You can increase your odds for survival and success through an effective marketing plan. Find out how to conduct your own market research, saving a substantial fee that you might otherwise have to pay to market research firms. Discover how to establish reasonable goals and objectives that will distinguish your marketing plan as sound and realistic rather than a document of wishful thinking that nobody will take seriously. Learn how to include plans for new marketing opportunities that may unexpectedly arise such as happened with social media where many businesses were left unprepared. Uncover the best ways to track the effectiveness or your marketing plan so you can update and make changes as needed. Save thousands of dollars by learning how to prepare your own marketing plan that is unique to your business objectives and goals rather than an expensive template plan offered by many firms that misses the mark.